No kidding, I have been working on this one since last fall. 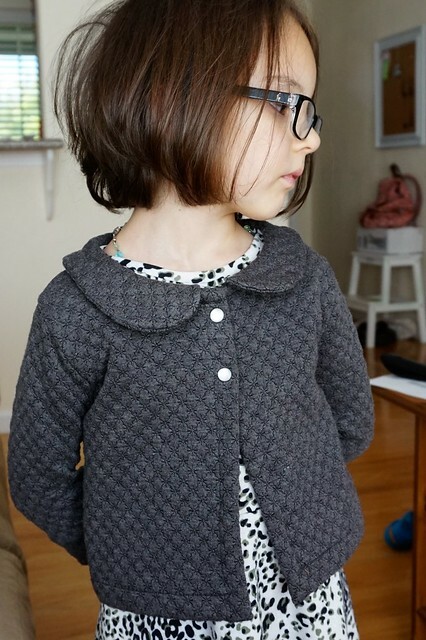 The Aster Cardigan is seriously such a cute cardigan pattern for little girls, and I love the collar. It’s perfect for fall and spring seasons, and I’m only now finishing the one meant for last fall. Better late than never! This is the same fabric I used for my Beauty Boatneck. 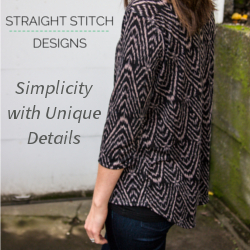 It’s a double knit with these little snowflake looking designs stitched in it. 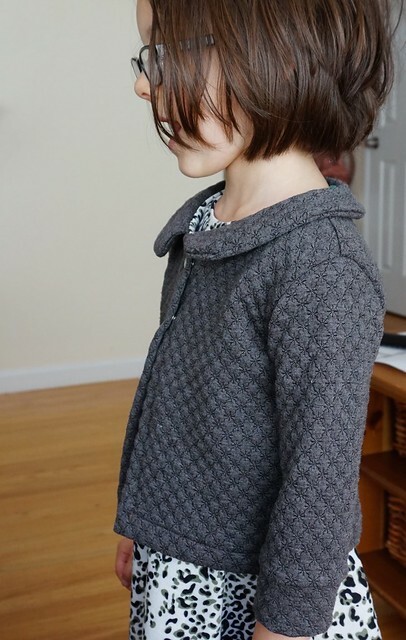 I constructed the first parts of this cardigan in less than an hour, assembling the body to the sleeves and sleeve cuffs. It was the hemming and adding the collar that took me forever. Why? Because I had to switch from my serger to my sewing machine, and y’all know how much I hate sewing knits on my sewing machine! I finally decided I need to finish some projects, so I put my walking foot on my sewing machine, switched to a ball point needle, and off I went. Now I can’t believe I procrastinated so long! This went so quickly, I know I’m going to make more for sure. I was worried that it wouldn’t fit her, considering I had cut a size 4, but it still fits, and little sis can wear it next anyway. Instead of buttons I used pearl snaps, finally breaking out my new snap tool. My inherited one was missing the pieces for pearl snaps, so I’m happy to finally get that going. It’s hard to see them in the picture because they’re reflecting all the light. 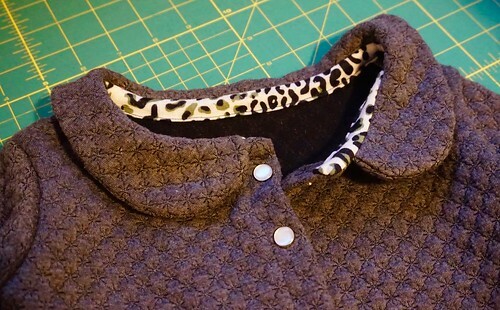 She picked out the leopard print for the neckline binding, which matches a dress I made for her awhile back. 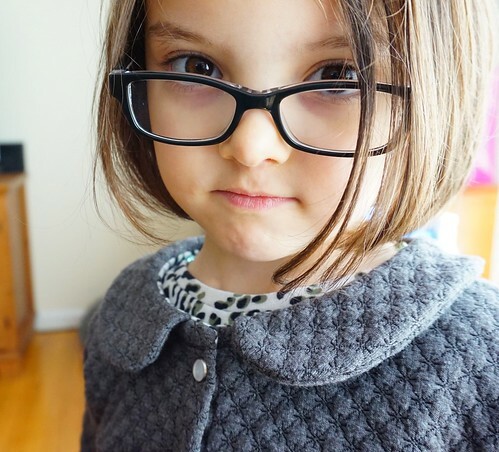 Can you believe she’s actually letting me take pictures of her, and she’s looking at the camera? We’ve turned a corner folks! Anyway, this is seriously a wardrobe staple for us now. 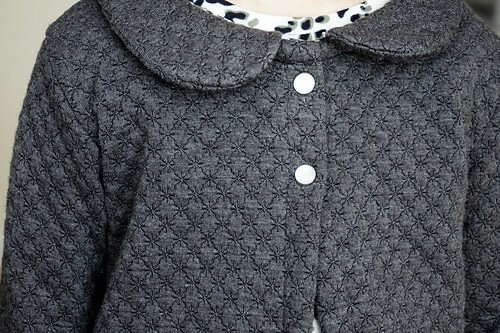 I really love this pattern and can’t wait to make more, even though I have to use my sewing machine. It wasn’t that bad though, I think because the fabric was not thin. Do you avoid patterns because of that? They’re cute, but you just dread a part of it? I’ll get over it quickly if the end result is this cute! She’s adorable! 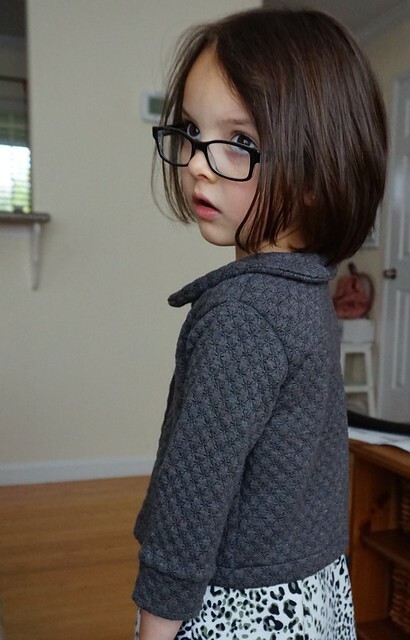 Great cardigan too!